We&apos;re still in shock after watching this baby swim the entire length of a swimming pool in just one breath. 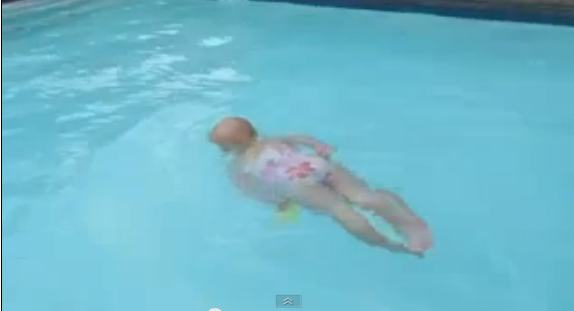 Elizabeth is just 16 months old and is as comfortable in a pool as a fish in water. But before you throw your baby in the pool and hit record, remember that this is no ordinary bub. She&apos;s just a brilliantly gifted swimmer. Whenever she gets puffed out she floats on her back for a rest. She&apos;s adorable. Her parents posted the video. Her dad is a registered nurse and her mum was a life guard for six years and used to teach swimming, so it&apos;s no surprise their daughter is so gifted. Unfortunately the parents have been forced by some YouTube commenters to explain the video, with some saying they are putting their child at risk. Dad Adam says she&apos;s been properly taught and at no point is she ever forced to swim. The parents even posted the following warning to viewers, as reported by the Daily Mail. "Please! do not just throw your child in the water and expect them to swim. That is both dangerous and a quick way to traumatize your child and scare them from ever swimming."